The consistency is quite runny which means that the squeeze tube is perfect for dispensing a controlled amount. The product is quite sheer which is good because it’s hard to overdo, but it’s tedious for anyone with a tan or darker skin because it requires layering. Considering this costs $25 for only 0.24 oz, I’d rather go with something like the e.l.f. HD Studio Blushes which are bit different but give you the same effect (and cost only $3 for 0.34 oz). I feel like I’m using up my Guava Beach Tint a bit too quickly. Of course the quality of the ingredients between those two is vastly different so that’s something to consider. I also found the Beach Tint to have a noticeable smell. It’s slightly fruity/floral but in a synthetic way (which puts me off). Lastly, I don’t like the way this applies with fingers. It takes a while to set and kinda rubs itself off while blending so I suggest using tapping motions only. I do really like it when applied with a brush. Once it’s on, the lasting power is amazing. Guava is a beautiful color which looks really natural on the cheeks. When used on the lips it gives you a very (very) subtle stain. However, I don’t like how this consistency feels on my lips so I will be using it exclusively on the cheeks in the future. There appears to be a bit of shimmer in the swatch below but it looks completely matte on the face. My experience with this product was mostly negative but there are some things I do like about it. Again, it’s not one of those “it’s terrible, it doesn’t work!” products. It comes down to personal preference. 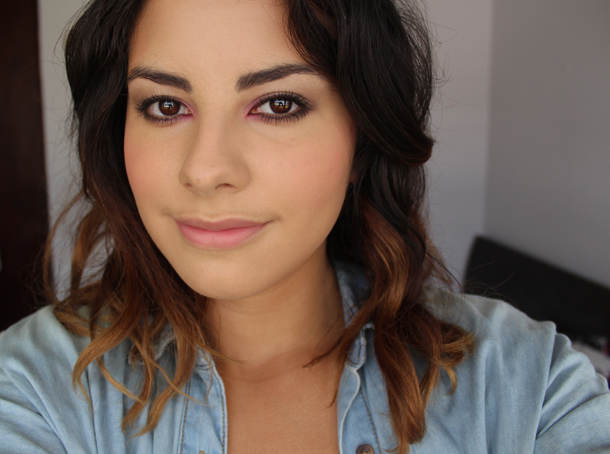 I like pigmented blushes with a cream or gel texture. The BECCA Beach Tint is too runny for me. Funnily enough, it reminds me of the Too Faced Shadow Insurance eyeshadow primer (in terms of consistency). It’s very watery and sometimes the “oil” in it separates. If you’re a long-time Shadow Insurance user I guess you know what I mean. I said this review would be short! I guess not… 🙂 Also, thank you for reading and supporting my blog! I recently reached 1400 Bloglovin’ and 1300 GFC readers. I’m very grateful and will be posting a giveaway soon! Have a nice weekend! I've heard so many good things about the Beach Tints, but I'm not very fond of watery stains.. I think I'm going to pass up on this one! Omg, what? 😀 I love beach tints and eye tints! Eye tints are the only cream products that don't crease on my oily eyelids and blushes look really natural on the skin. TOP products for me. It looks quite beautiful! It's a shame you didn't fall in love with it. I heard a lot of people loved it. It's nice to see a different opinion though. I like the colour! It's purdy. And your eye makeup looks amazing! I really want to try some products from Becca but I must admit, these do look a little bit difficult to work with. Saying that, it looks absolutely beautiful on – gives you a really pretty glow. I love your eye makeup in this photo! I've honestly never had very much interest in any Becca products. My JCSephora has a mini duo thing of a tint and whatever the other product is, but I've never had the urge to try it and I probably still won't. Thanks for this review! I've been thinking about getting into the area of cream and gel blushers, so it's good to know that this one isn't quite worth the money. And congratulations for reaching all those followers! Besos! I haven't heard too much about Becca products but this one doesn't sound that amazing. It's shame becuase it's so expensive. I've been really intrigued by Becca make up products, but there's something that always holds me back from purchasing. I think there are better products that are more affordable. Great review lovely, I think this colour looks beautiful on you! I don't think there's anything that doesn't suit you, I'm very jealous! This looks gorgeous! It looks very natural yet very pretty! Such a shame that this wasn't so great overall because it really does look GORGEOUS on your cheeks! You look absolutely radiant and glowing 🙂 But I completely understand that even if something looks great if you know exactly how to work with it, sometimes you just can't be bothered with the extra hassle. This looks so great on you, it's a shame you didn't get on with it too well. I'd still be tempted to pick it up and see how it works for me just on the off chance it did because I absolutely adore the shade of it! I think I'd like to try one out! My skintone is a bit lighter than yours and I really like sheer flushes of color, although the price is putting me off a bit. I think I just like the whole concept and it looks really beautiful on you! I didn't totally love these either. My shade may have been off, but it just melted into my skin and I couldn't see it! (Fig). I find the beach tints vary quite a bit in pigmentation. I love Peach, but Watermelon is super sheer on me. Guava looks gorgeous on you!